American Morning’s Friday viewers remained focused on the pending confirmation hearings of Judge Sotomayor, as many expressed appreciation for AM’s in-depth coverage; others were frustrated that the “racism” comment attributed to Sotomayor was presented out of context. Bruce: Regarding Pres. Obama's supreme court nominee...I thought we had a process in place. First, the nomination then the Senate confirmation hearings. When did this process become so inflammatory? Why do we need commentary from the pundits, when the Senators will ask all the necessary questions and will then vote on her? Unfortunately, this process has become so partisan because the opposing party wants to tarnish the nominee. Who wants to go through that? This process should be dignified not a Jerry Springer episode. This is exactly why so many people are turned off by politics! Ginspelts: The thing that worries me the most about Sotomayor is the video I saw where she is laughing and carrying on about "Judges are in the business of making policies. Oh I know I shouldn't say that. We are being filmed on camera, but hey we all know it is true." Judges do not make policies or the law. Judges are only suppose to interpret the law. As a American citizen these comments concern me greatly. I would like to know exactly what she meant when she made the comments. It is the job of congress to ask some very tough questions before making her one of the highest judges in the Supreme Court of the United States in America. Has the American public been too quick to judge Sotomayor? What questions would you like to hear the Senate Confirmation Committee present to Judge Sotomayor? Molly Greer, in her New York classroom, says she now wants to make teaching her career. NEW YORK - Talking excitedly and pacing the front of her classroom, Molly Greer engages her students. "What are different paces you can go when you're reading aloud? Christina?" "Low." "Okay, low or soft, yes." On the first day of school, most of the kids in Greer's eighth-grade class could not read at a sixth-grade level. With summer almost here, it's a totally different story for these kids, who according to their school are expected to read at or near grade level. "It is an incredible thing for these students." Greer graduated with honors from the University of Wisconsin. She arrived at PS 212, the multicultural magnet school in the Bronx, New York, two years ago with a degree in political science and a desire to change the world. "When I found out about Teach For America," she said, "I realized that teaching would be such an incredible way to make an impact." Teach For America is like a local Peace Corps serving some of the country's poorest public schools in inner cities and in rural areas. It has grown every year since its inception in 1990, sending 20,000 college graduates into the nation's neediest classrooms for a two-year commitment. This year, amid a tight job market, it is more popular than ever. According to the organizations Web site, their teachers get paid the same salary and benefits as beginning teachers in their area and are paid by the local school district. The American Morning staff softball players pose for a photo. The sun was out, the temperature balmy, and a slight breeze coming in from the left at five miles an hour, as our meteorologist Rob Marciano might say. It was finally perfect weather for the American Morning folks to take their bats and mitts and head to beautiful Central Park for a game of good old-fashioned softball. If you read our weekly Meet AM blogs, something you should know about the crew is that we really like a game of softball. Our softball “league” started last year, and by league I mean bunch of people who head towards a field, play, and leave without being quite sure what team they were on, what the score was, and indeed what game was played. This year we decided to be more organized, and teams were picked in a lavish ceremony that would rival the NFL draft. Or, perhaps one I hastily threw together post-show in ten minutes in my duties as captain of the noble Barracudas. Our heroes, the Barracudas, duked it out with the evil Gobsmackers (HISS) on a clear, warm Friday in May. Though innings were played well above regulation for either softball or baseball, the Gobsmackers “won”. The score is lost to the annals of history, thank God, because I think it was kind of embarrassing for our team. The game was fiercely fought and both teams pulled out all the stops. Because of an umpire strike (Judge Sotomayor – fix this! ), even German tourists stepped in to make critical calls. Danke schön, Dieter. The Barracudas truly appreciate that call of safe at third. We made it pay off for you, mein freund, at least that time. Completely impartially, the game’s MVP was writer Brian Seligson, who knocks it out of the park both on and off the field. Seligson’s hits and catches have an artistry to them that can only be compared to dancers’ grace. His only flaw is that he is a Gobsmacker. Teammates, if your faithful leader tries to trade you for him, don’t be insulted. Only know that trading for Brian is like trading for a 1909 T-206 Honus Wagner baseball card – darn near impossible. While the brave Barracudas lost – some might say unfairly, in a game that was rigged from the start and should be struck from all records – what truly matters is that no one remembers the score. Or do they? It doesn’t matter. I have my secret weapon in reserve. Let’s just say, he might have landed a plane in the Hudson and his name might rhyme with Mully Mullenberger. Bring it on. 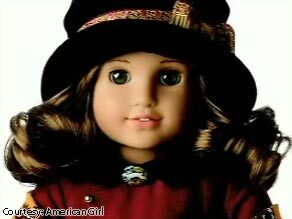 American Girl unveils Rebecca Rubin, their first Jewish-American doll. American Girl dolls are known for their unique identities, representing different time periods and ethnic cultures. CNN’s Lola Ogunnaike got a sneak peak at the latest one to find out what's different about her. She's nine years old, 18 inches tall and has luscious brown hair. Offer a warm shalom to Rebecca Rubin, American Girl's first historical Jewish doll. “She's born here in New York, her parents have emigrated from Russia and she goes through those trials and tribulations of a traditional family with her bubbe [grandmother] and her mom and her dad…and understanding what life was like on the Lower East Side,” says Judith Herbst, Senior Manager for Marketing, American Girl. Rebecca has been in the works since 2000. The shade of her hair, the style of her dress, her life in the early 1900's were all meticulously researched. Even her accessories are historically accurate. “For Hanukkah…there is a menorah, there is a Shabbat set, there's a challah set,” says Herbst. New York City's Tenement Museum will host tours for girls eager to learn more about Rebecca's fictional past. “What we're extraordinarily pleased with, is the degree now to which the Rebecca Rubin story parallels, tells through a doll the same story we tell through this building…It's a story of struggle, it's a story of coming to the United States because of aspiration and hope,” says Morris J. Vogel, President Lower East Side Tenement Museum. The young ladies we talked to were more interested in hair than history when they got an early peak at the new girl in town. “I love her hair and she's just so pretty and her dress…It's so pretty. I love the red. Red is one of my favorite colors so I really like it,” said Abby. “Her hair is very wavy,” said Caroline. “What do you think of her shoes,” I asked Chantel. “Very lovely…The leather of them. Very good,” she said. Clearly they're sold. Now all the girls have to do is convince their moms. “The puppy dog face really works and if she says no, go to daddy, so that usually gets it,” Abby said with a smile. 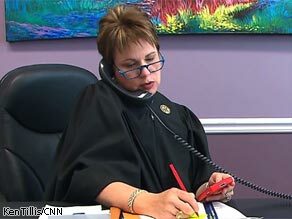 New Orleans Judge Laurie White in her chambers as she prepares for a hearing. (Washington, DC) - I’ve spent a lot of time in my career as a journalist in and out of courthouses covering murders, rapists, and other nefarious folks who got put away for a long time. Being in court can be pretty dramatic regardless of what side you’re on. Emotions run high and it's generally cramped quarters, especially for the victim’s family members who could be sitting a few feet from the accused killer. Those tensions can and sometimes do explode. Look no further than the Atlanta courthouse shooting in 2005 or the judge in Florida who leaped over the bench in March after a defendant attacked a victim during in a hearing. For judges – safety is becoming a growing concern. A report released by the U.S. Marshals says threats against prosecutors and federal judges have gone from 500 in 2003 to 1,200 in 2008. Jeanne Meserve and I spoke with a few judges for our piece this morning. All had horror stories of being threatened either early in their careers as an attorney or while on the bench. Judge Laurie White, a criminal court judge in New Orleans, LA said, “If you're going to get elected and be in the rough and tough world of criminal justice you can't be shy and you'd better have nerves of steel. And you better have a strong gut. It's not an easy spot and I think you do this job at your own personal risk and the point is whether you depend on everyone else to protect you or you provide a lot of your own protection." In New Orleans the only person allowed to carry a firearm by law is the judge, but in Washington, D.C. neither the judges nor the bailiffs have firearms on them in the courtroom. 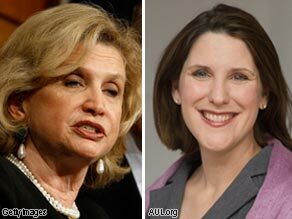 Rep. Carolyn Maloney (L) and Charmaine Yoest (R). This week, Supreme Court battles and new spending promises are pre-occupying Washington, and giving us the Wingnuts of the Week. Supreme Court nominations have become the Wingnut Olympics. Right-wing attacks were readied weeks ago against whomever President Obama named to the court. Left-wing hyper-partisans have done the same thing to Republican appointees in the past. They try to demonize a nominee before they have their day in court – or in front of Congress, as the case may be. The idea of actually judging a judge fairly or suspending judgment until all the facts are in seems to be unheard of in DC these days. It’s a reflexive ideological attack, regardless of facts. But of all the prefabricated attack-dog talking points circulated, one set rose to Wingnut of the Week status. Charmaine Yoest, President of Americans United For Life, released a statement saying that Judge Sonia Sotomayor "Will perpetuate the role of the Supreme Court as 'National Abortion Control Board'... [her] judicial philosophy undermines common ground. She is a radical pick that divides America." There are legitimate ways to question and criticize a Supreme Court nominee – by quoting past statements and studying past opinions. But Yoest’s comments were ugly on a whole different level, treating Judge Sotomayor as a threat to the republic. That’s an absurd demonization and dehumanization. Yoest is claiming that Judge Sotomayor divides Americans, but Yoest is the one trying to divide us. The fact is we don’t even know Judge Sotomayor’s position on abortion – she backed up the Bush administration’s right to deny federal funds to abortion rights organizations in one decision. Some liberal groups are expressing concern that she might not be liberal enough for their liking on this issue – but all that seems to be an inconvenient truth. And calling the Supreme Court the “National Abortion Control Board” – well that’s about as single-issue wingnut as you get. I’m pretty sure that’s not how Chief Justice John Roberts views his day job. Wingnuts use fear as a recruiting tool. For them, all’s fair in love, war and Supreme Court nomination battles.